1920s Freemason Clock - anyone know about these? Thread: 1920s Freemason Clock - anyone know about these? Seeking any interesting information about this 1920s (I think) Freemason Clock. It's my god father's and it was his grandfather's. Very unusual, in silver, with detailed engravings, interesting dial and a slightly domed triangle crystal. Looks like it is meant to be worn on a waistcoat with a chain, can also stand up using the built in stand. My godfather is also interested in likely value for insurance purposes. Abit of info, not much though here. Thanks, definitely some similar ones there. I can add very little regards value but being on the square I can appreciate the significance and boy is that an incredible piece. It looks like something Catweazle would have owned. Exactly, my godfather wears it and also appreciates it having been in the family. He is disappointed nobody ever asks about it though! Thanks Duncan, good memory and Google skills! I can't add anything useful apart from to say that's a lovely thing, what a great thing to own. 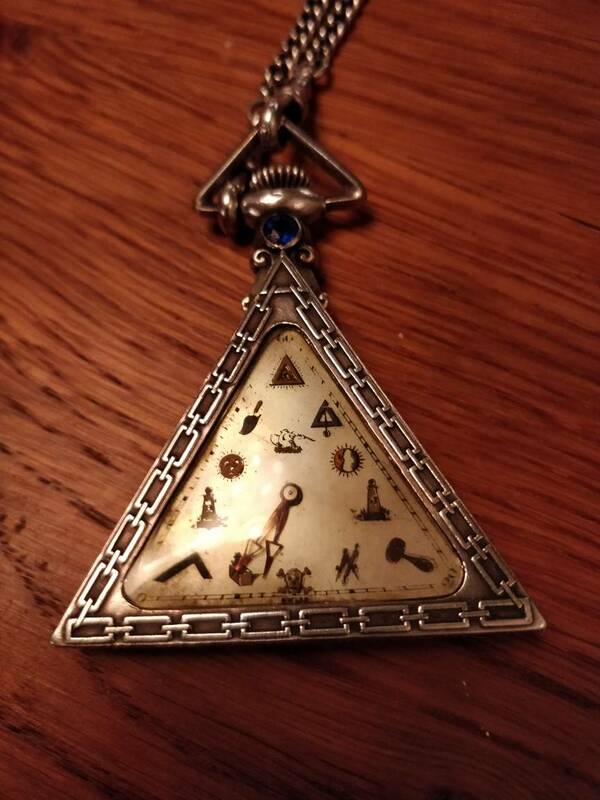 Also the link posted earlier displayed quite a number of other gorgeous and interesting freemasonary watches. What interesting things they are. Thanks for posting the photos. My late father was on the square but I have never been interested in joining, I have so much of his regalia, no idea what you do with it but no watches that I'm aware of. You could perhaps contact the lodge secretary and see if they would like it depending on what items of regalia you have. Thanks, after I posted this i googled it and that seems a general consensus, I'll look in to that. Possibly part of the problem is that people don't actually know what they are looking at? So much of Freemasonry symbolism is hidden in plain sight. Both my paternal and maternal lines include high-ranking Masons going back many years. I saw various things as a little lad but it is only years later as an adult that I understand the significance. As an aside, I have one of those little Masonic orb things that fold out into a cross with each of the 6 sections being little pyramids with rather intricately carved symbols. Lovely little thing. Ah but this is at Masonic events when people don't ask! Thanks! Would be interesting to see a photo.